‘We were ordered to dismount and then we heard the strangest command it has ever been my misfortune to receive. 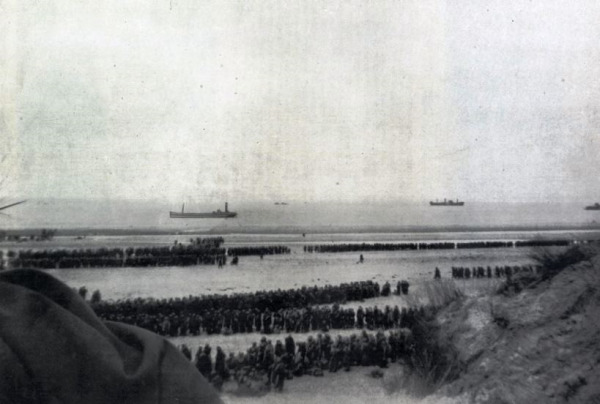 “Every man for himself – make your own way to Dunkirk!’ shouted a sergeant. Our dulled wits and blunted minds refused to take this in. Where was Dunkirk? I thought for one bemused moment that it was Scotland. “How the bloody hell do we get to Scotland?” I asked Jim. I will not repeat his answer. Another wild rumour which was circuiting was that the war was over and we were going home. “I wish someone would tell the Germans that the war is over,” said the dour Jim, and we all laughed. This strange noise seemed to do us all good. We had not heard the sound of laughter for a long time. “You’re on your own now!” shouted the sergeant. “We’ve been on our own for bloody weeks!” cracked Jim and again we all laughed. ‘Soon we were entering the main port of Dunkirk, which appeared to be largely in flames and the dismal sound of collapsing buildings reverberated through the empty streets. It appeared there had just been an air raid. Dunkirk was in ruins. The roads were cratered everywhere and tram lines stood on end where the many bombs had landed. The corpses of mutilated soldiers lay everywhere and the smell of burning flesh was nauseating. Once again it appeared that we were quite lost and I looked for any person to ask the way to the docks. However, apart from other odd groups of disconsolate soldiers, who were as lost as us, the streets were empty. However as we wandered, without direction but with much urgency, I saw a woman’s face peering up at us from a grating in a cellar. ‘Having come this far, we did not intend to be taken prisoner and we were ready to put to sea on a plank if this was the only thing available. However, the officer was genuine and he selected the most senior NCO among us and gave him some instructions. We had the feeling of inexpressible relief at having the responsibility of decision-making taken away from us. We joined the line and made a passable attempt at standing to attention. Our ‘right turn’ showed some semblance of military precision! A few minutes’ marching brought us to the dock area and a few more to the beaches. Here we sat on the sand at the part of Dunkirk beach where the long concrete East mole protected the docks from the sea. The sight, which met our eyes as we looked across the sand, was not encouraging. The evidence of a large army having been there was very strong. The usual litter of unwanted items stretched away into the distance and it was evident we were at the tail end of the retreat to the sea. I had suspected this for some days, and we saw no signs of shipping, big or small, to evacuate us. I wondered whether all our trials and tribulations had been in vain. To make matters worse, there was no one there who we could ask. An occasional officer walked past but they were unapproachable. We consoled ourselves that, while they were still there, we must stand some chance of escape. ‘They were trying to jump the queue by climbing up onto the mole, running along it for a few yards, then jumping down into a more advantageous position. The order was rapped out, and was followed by a grave warning. ‘As we waited patiently on the darkness, like so many dumb beasts, for the boats to arrive on the tide, we heard a naval gun firing in the Channel. It seemed to be firing heavy shells at two-minute intervals. We first saw a flash about ten miles out to sea. This was followed by a heavy rumble, then a high pitched whine as the shell passed over our heads. Seconds later we heard an explosion as the shell landed, we hoped, upon the enemy. We were pleased the British were putting up some resistance. The night wore on and it became cold. I wondered how the Germans would treat us if they ever took us prisoner as was becoming increasingly likely. We knew the German Panzers were merely waiting for first light to move in and mop us up. We were comforted to know that the Germans did not attack with tanks at night. However, the night was wearing on and time was running out. We could hear the enemy tanks on the move getting ready for the coming of dawn. At this stage we did not know how many soldiers had already been taken off the beach but it was obvious it was a great number. ‘Just ahead in the blackness, I suddenly discerned the masts and superstructure of a ship. It was not a big ship, but big enough! A wave of emotion swept over me. I felt like weeping with weakness and relief but there was no time for emotional outbursts. I was soon standing and looking down at the comforting sight of a little wooden boat, which I later learned was a Dutch fishing boat. It had a name that seemed to go all the way round the gunwale. I noticed, in the darkness, another similar boat pulling away from the mole. 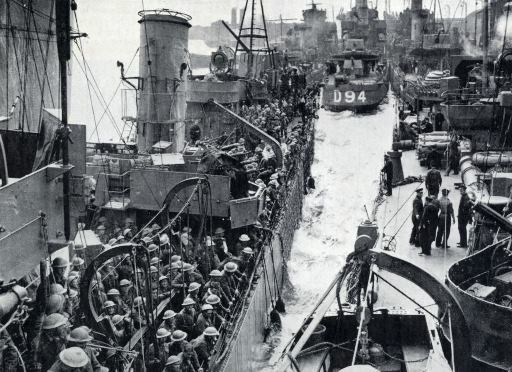 As there were no others, it seems that the boat we were about to board would be the last to leave Dunkirk (the following day Dunkirk was fully taken by the Germans). If this was the case, and I see no reason why it would not be, it meant that we had the distinction of being the last troops to leave Dunkirk. We had already been the last troops out of Lille. Although this was not much to be proud of, it made me feel we had been extremely lucky to get away in the circumstances. I climbed wearily down the steel ladder, which was fixed to the mole’s steep side, and lost my foothold. I slipped down into blackness of the hold and landed upon something soft, which aimed a blow at me and cursed! The hold was crammed with soldiers who had lain on the floor and gone to sleep. I had fallen on some unfortunate person, although I never found out what damage I had done to him and he never knew who landed on him! I sank down and went to sleep and allowed the wearisome load of my worries to slip off my shoulders. The relief was unbelievable and I slipped into a kind of unconsciousness, which was not really sleep. Sometime later, I was jerked back into wakefulness. Jim was shaking me. I looked at his dark outline and grunted “What do you want now?” somewhat irritably. “Do you want to see the coast disappear?” he asked. Somehow it seemed as though Jim had managed to keep himself awake until he was sure we were moving. I marvelled at his stamina. Together we picked our way through the mass of sleeping soldiers and climbed up the stairs and onto the deck. The sight was rewarding. The coastline was about half a mile away now and was illuminated by many fires which burnt along the front. We were actually leaving France! We had left the dock area and were out into the open sea. It was wonderful and the thrill of it made me forget my weariness. In the docks a crane was working. It sounded strange coming from across the water and whenever I have since heard a crane working, my mind has carried back to that strange night. ‘In the excitement of the past weeks, I had lost all sense of time and was quite unaware of the date. When I finally saw a newspaper (I think it was the Daily Mail) and saw that it was June 3, I read it with interest. The headline was 'Evacuation of Dunkirk now complete' and it described how the last of the troops had been brought home. 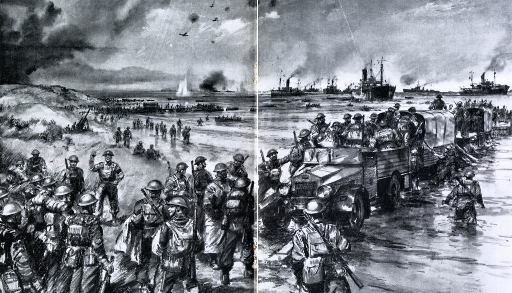 There was a cartoon, which depicted a British soldier standing on the beach at Dunkirk. He was shaking his fist and saying, "We'll be back!" There’s nothing quite like reading a personal account of war as history unfolds itself through the eyes of somebody who was actually there. Forces War Records is fortunate to receive such amazing real life war stories, and now you can read some of them – completely free of charge – here, including Troop Sergeant Bernard Kaye's full account of his WWII experiences. If you have a relative’s war diary at home, we’d love to hear about it!